Novobanco by Flatstudio | New bank, new app, new redesign. Novo Bank is a Portuguese based bank responsible for the acquisition and management of the assets and liabilities formerly owned by Banco Espírito Santo (BES), the one time second largest private institution in Portugal. Develop an innovative eBanking mobile application for Novo Banco to help boost the functionality of the bank. 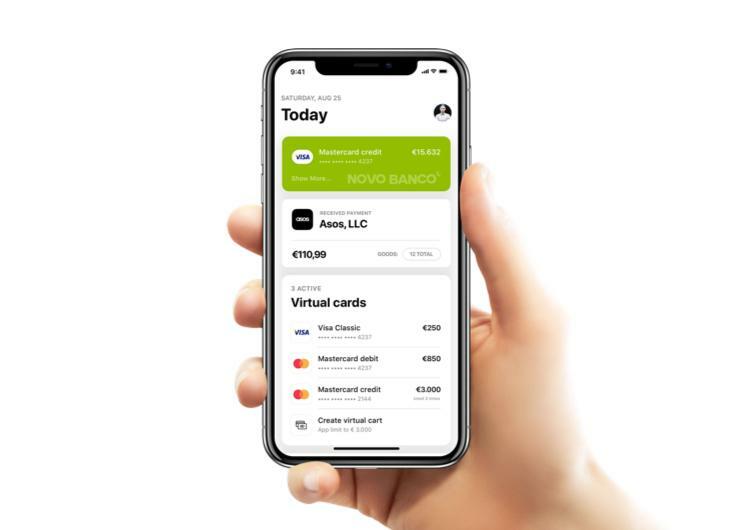 We have created a new and original mobile banking application for Novo Banco in style and performance with a range of capabilities to facilitate both basic and complex digital banking services for the end user. Details and activities on your account via yesterday, today and tomorrow feature. Exchange function helps out with currency trade - both fiat and digital. Make convenient and frictionless payments to all bank users. Our team created a number of graphical illustrations related to the available banking services to help users understand the essence of Novo Banco. Real time, real banking in your hand. Account balance? Check. Transaction activity? Check. Cryptocurrency trading rate? Check. We create a Today page that brings you the latest details on the banking activities related to your account. We developed a number of modals windows on the app to improve the user experience. There are pop-ups to display your set financial goals, incoming payments, currencies exchange and a bunch of related elements. Here you can view the current exchange rates, stock market valuation, price fluctuation patterns for Bitcoin and several fiat currencies used across different countries in the world. An app with a message. We created a menu function which opens a properly categorised display of all the major services offered on the app with drop down buttons for swift navigation to boost user friendliness. Customer service like never before. If you wish to make a complaint, a request or a suggestion, you do not have to go down to a physical Novo Banco branch for that. We designed a Help Center function where you can access a customer care agent to help you out with issues. Easy right? To give potential users an insight into NB app, we produced a series of custom widgets, settings and switching between different bank accounts. Here you can make service payments, pay your phone bills and taxes to the state. There is also search function which lets you to look up features with ‘My favorites’ section where you can view your most frequented used activities. Digital card for your digital bank. Users can set up a virtual credit/debit card. The virtual card will be linked to a physical card you already own and was designed to function just like one. In the payment section, our team included innovative features to support payments and other transactions between users in different countries of the world. Across oceans and borders, let Novo Banco will wire the cash. Advanced security just for you. When it comes to cyber security, there's no such thing as too much security. That's what we had in mind when we integrated hi-tech verification systems on the app. From QR code authentication to voice recognition to face identification, you can be rest assured your money is in safe hands. We developed an advanced payment system that allows for easy payment to others within the same country via the national transactions. This function allows user to send money to friends using their phone number. There are few things worse than being out of reach nowadays so charging one's phone is made easy and quick. An innovative solution to help users keep track of the money was integrated. Under 'Activity' you can view where, when and how every dime that left your account was spent. We designed and included a map navigation feature so that where you are, you can always search and navigate your way to the nearest NB branch offices or ATMs if you need to. A number of banking related icons and buttons were specifically created for use within the Novo Banco app to bolster the user experience. A lot of graphical illustrations related to the offered services in the lay out of the Novo Banco app. Things can get boring with letters and figures and our dynamic graphics are set to enhance the experience for the end user.